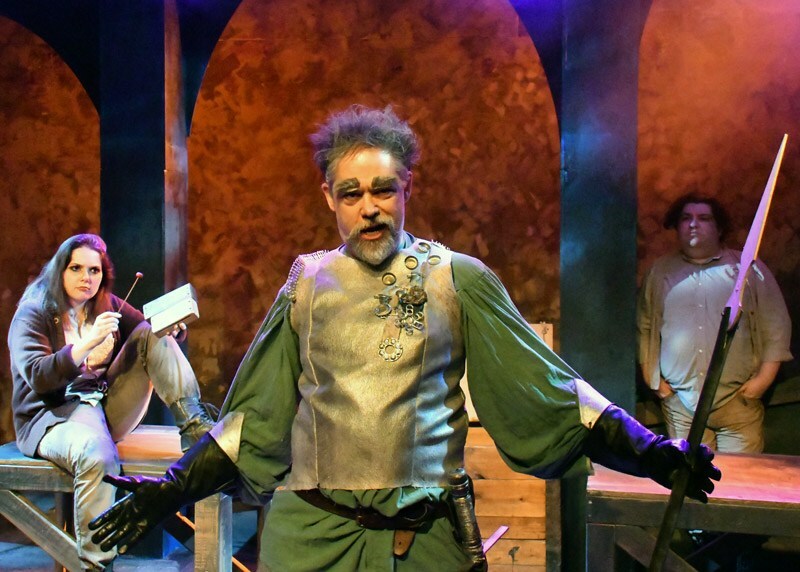 “Man of La Mancha” Shines Amidst Challenges, at Custom Made, S.F. A greying man with a silvery vest, like armor worn by knights of old, gazes into the distance. He sings wistfully about his “Impossible Dream” to “fight the unbeatable foe” and “reach the unreachable star” in an unforgiving world, surprisingly tender for an old guy wearing a basket for a helmet. 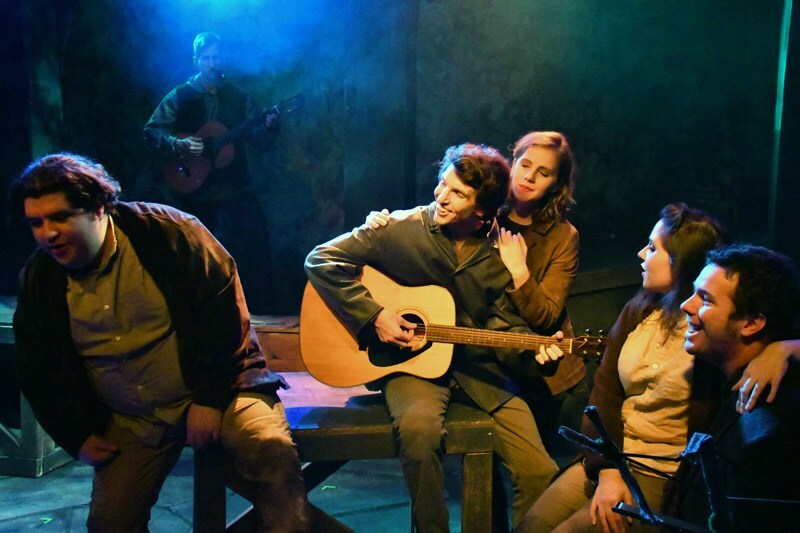 Vain hope dominates “Man of La Mancha” at Custom Made Theatre, in at their cosy, intimate space. Director Brian Katz spotlights the idealistic theme, to revitalize us in a dark time. In “Man of La Mancha,” the great Spanish novelist Miguel de Cervantes (memorable Edward Hightower) and his manservant (charming Dave Leon) are tossed in prison by the medieval Spanish Church. In the dungeons, Cervantes defends himself against his fellow prisoners in a mock trial. Cervantes cobbles together make-up and a costume, gluing on marvelous fake eyebrows, to transform himself into Don Quixote. Cervantes creates a character for the ages: a half-mad gentleman who believes himself to be a knight. His anxious servant slips on a leather jerkin and becomes the chipper squire, Sancho Panza. Cervantes ropes in the prisoners to act out in his flawlessly executed play-within-a-play. Anthony Aranda morphs brilliantly from swaggering Governor of the prison to put-upon Innkeeper. The cast pulls double-duty as musicians, playing “Dulcinea” and “The Impossible Dream.” The strumming guitar perfectly accompanies the comedic capers of Don Quixote and Sancho, as they bumble through quixotic misadventures, battling a windmill along the way. Hightower steals the show with his impassioned performance. His crooning is closer to speaking than singing; but when he belts it out, the notes ring with unmistakable force. He impressively juggles the serious and the silly. As Don Quixote, Hightower delightfully embodies the honest, doddering knight. He conveys Quixote’s sincere faith and grit, in the face of relentless reality. But the evening’s fun is shattered when kitchen girl Aldonza (fiery Rachael Richman) is graphically raped by a trio of muleteers. Aldonza is held, facing the audience under hellish red lights. The scene feels exploitative, especially because it serves to further Quixote’s arc of nobility. 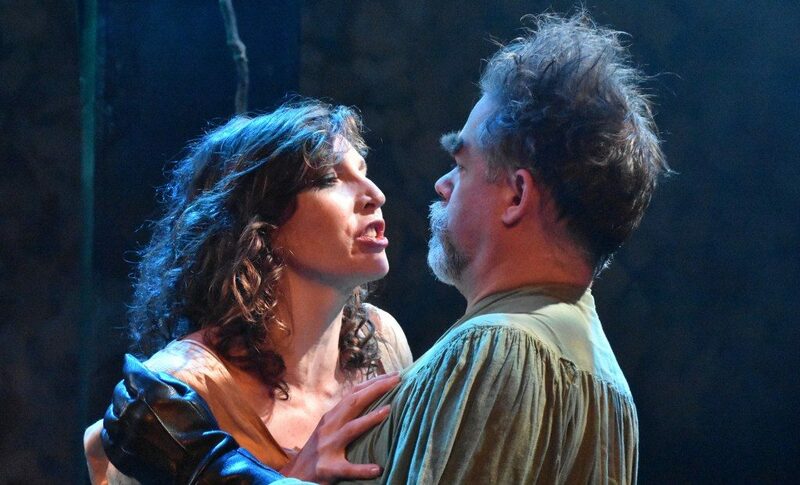 Even though his antics led to her assault, Aldonza forgives Quixote and together they sing a reprise of “The Impossible Dream” to ultimately prove him right. Katz takes us on a fantastic romp through the shenanigans of delusional Don Quixote. But his motivation feels misguided when a woman is attacked for the glorification of the male lead. 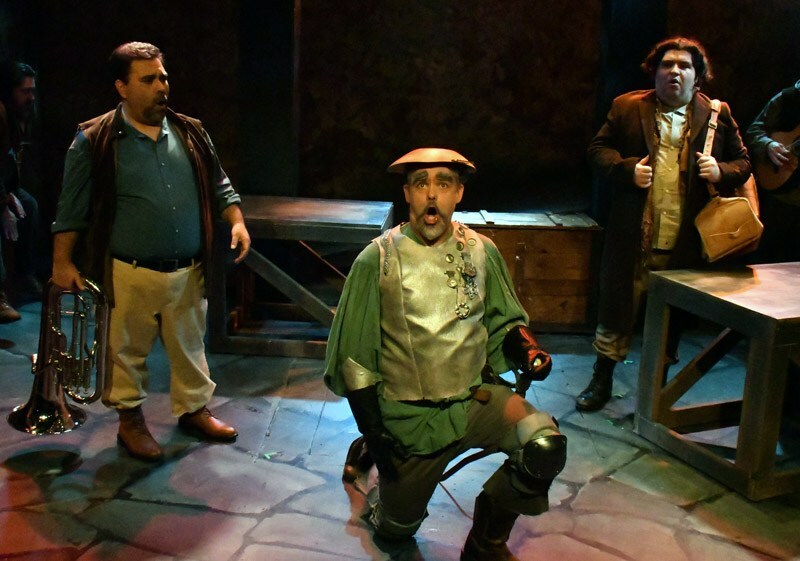 “Man of La Mancha” aims to be a galvanizing tale on how to overcome the hardships of life. It seems that the best way to “fight the unbeatable foe” is to run right past him and let victims take care of themselves. Don Quixote seeks to battle tyrants in the name of chivalry. Wouldn’t it be better if a quixotic knight battled tyranny on behalf of living people, rather than a quaint abstract ideal? Cast: Anthony Aranda, Kimberly Cohan, James Grady, Edward Hightower, Paul Hogarth, Emily Jeanes, Dave Leon, Jenny Matteucci, Emma Onasch, Jack O’Reilly, Rachael Richman, Shelby Stewart, and Mauricio Suarez.